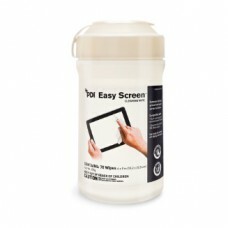 Finally, a compatible touch-screen cleaner that works at the speed of technology. Easy Screen Wipes feature the cleaning power of 70% isopropyl alcohol while being compatible with touch-screen healthcare equipment. They rapidly clean dirt, grime, fingerprints and smudges. They are fast-drying and leave no residue fogging or streaking. From tablets in hallway kiosks to doctors' own smartphones, touchscreen surfaces abound in healthcare settings. Deployed by doctors and nurses in a multitude of patient-facing scenarios - everything from x-ray screens to ultrasound touchscreens to bedside portals - more screens pose more risk of spreading infection.